Summerbreeze ist schweizer Perfektion! Luxusgarn, in der Schweiz hergestellt und ebenfalls in der Schweiz von Hand gefärbt. Seide und Bambus sind grossartig für heisse Sommertage. Weich direkt ab dem Webstuhl, fliesst in der Hand wie Butter und hat trotzdem genügend Griff, damit nach dem Binden nichts verrutscht. In der Maschine waschbar und passend für alle. Dear Pellis , today another limited Little Monarch in beautiful colors for you. You ask incessantly about turquoise Monarchs. This time we have made a few pieces with cotton and bamboo viscose, which cools you during hot days and makes the wrap soft and glittering- bamboo is called artificial silk for a rason. The wrap is also incredibly carrying because only one turquoise thread of weft is bamboo. The white and the black ones are combed cotton, what provides comfort even during carrying a 3years old. The wrap will be accessible by drawing the right to buy. 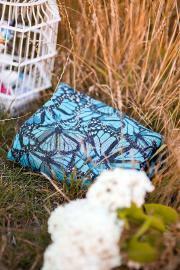 Inception 018 is a great medium weight summer wrap. It is easy care - you can wash it in a washing machine. The wrap is very airy with a nice cooling touch. Bamboo makes it smooth and glidey, linen (with is little crunchy) adds a grip. The wrap is very soft and smooth after some breaking in. Best for medium weight babies. The new Marie Stars combines the beautiful rainbow color gradient with high quality materials. 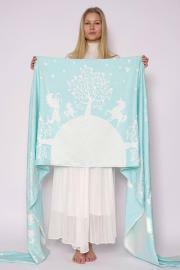 Exquisite organic cotton and shiny bamboo viscose give an extraordinary glimmer to this Kokadi. 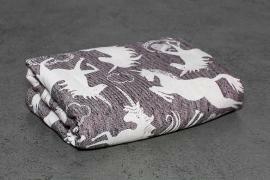 The timeless star design has been woven into this cuddly but handy cloth. 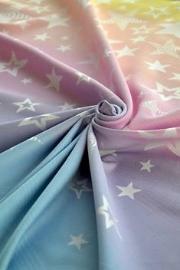 Marie Stars comes with a grammage of 272g/m2, will accompany you during the whole babywearing time. Do you already know our new Arielle Mystery? 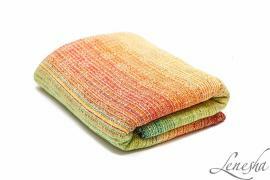 The woven wrap looks very warm and lively because of the popular jacquard weave. On one side of the wrap, the color combination of red and blue, creates an intensive purple look, connected with yellow and cream on one side of the wrap, it will let your baby shine. 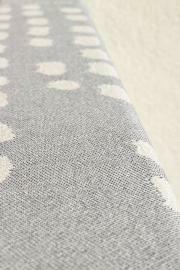 And on the other side of the wrap, cream is the main color with a subtle Arielle design – perfect for a classic outfit. The cloth is adorable on both sides. So you have decide which one you like most. The material of 50% high quality organic cotton and 50% shimmering bamboo viscose and a grammage of 300 g/m2 will secure your baby through the whole babywearing time. LITTLE LOVE AQUA - like calm surface of water with light reflection! Little Love pattern - in amazingly soft version of Little Love - smooth and enchanting by its delicate shimmer (60 % combed cotton, 40% bamboo viscose; 270g/m2). This version of Little Love is perfect for little babies and toddlers. Thanks to bamboo, it will be also a great choice for warm climate. Bamboo is powerfully isolating, highly moisture absorbing and protects from UV. What a wonderful couple – Charlotte and Charlie! 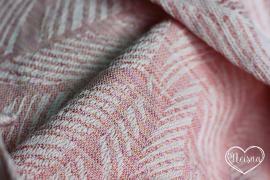 This woven wraps will conquer the hearts of moms and dads and their babies in tender turquoise and tender pink. 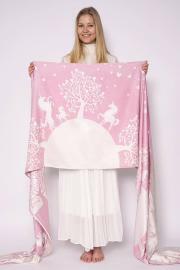 It comes as a limited edition - a shiny dream of pastel colors. 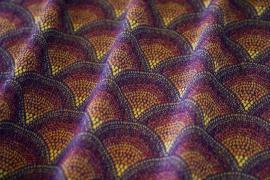 It is high quality woven and shimmers like silk and is super soft like wool. This special silk touch weave is specially developed by Kokadi for Charlie and Charlotte. It is a haptical and optical highlight. It comes with a grammage of 2880g/m2. Babywearing like walking on clouds. La fascia rigida Lokum Rose 60% Cotone Bio 40% Bamboo Viscose , è utilizzabile fin dai primi giorni di vita e permette di portare il bambino in diverse posizioni a seconda delle esigenze: pancia a pancia, sul fianco e sulla schiena. Il pattern della fascia rigida porta bebè Lokum Rose si presenta come un intreccio di nuvole e la presenza di bamboo, nota per le proprietà antibatteriche e antimicrobiche, dona alla fascia una naturale lucentezza e un’eccellente morbidezza al tatto. La tessitura a trama diagonale avvolge perfettamente il bimbo e il portatore, garantendo comfort e sostegno. Gli orli didattici rendono le fasce porta bebè Neko Slings idonee anche per chi si avvicina al babywearing per la prima volta. La fascia è accompagnata dal Manuale di Istruzioni in italiano. La fascia rigida Lokum Minty 60% Cotone Bio 40% Bamboo Viscose , è utilizzabile fin dai primi giorni di vita e permette di portare il bambino in diverse posizioni a seconda delle esigenze: pancia a pancia, sul fianco e sulla schiena. Il pattern della fascia rigida porta bebè Lokum Minty si presenta come un intreccio di nuvole e la presenza di bamboo, nota per le proprietà antibatteriche e antimicrobiche, dona alla fascia una naturale lucentezza e un’eccellente morbidezza al tatto. La fascia rigida Lokum Hazel 60% Cotone Bio 40% Bamboo Viscose , è utilizzabile fin dai primi giorni di vita e permette di portare il bambino in diverse posizioni a seconda delle esigenze: pancia a pancia, sul fianco e sulla schiena. Il pattern della fascia rigida porta bebè Lokum Hazel si presenta come un intreccio di nuvole e la presenza di bamboo, nota per le proprietà antibatteriche e antimicrobiche, dona alla fascia una naturale lucentezza e un’eccellente morbidezza al tatto. Reach for the stars and grab the rainbow. It is time for dreaming and cuddling. 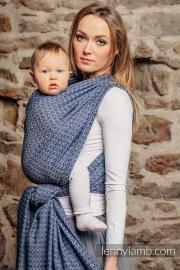 The new Kokadi Viktoria Stars made of 60% high-quality organic cotton and 40% super soft bamboo viscose is perfect for happy babywearing moments with your beloved baby.